Our church runs a Preschool that accommodates 3 - 4 year old and Pre-Kindergarten children. For over thirty years, parents have trusted us with the care and education of their young children. We believe that our program provides a learning environment concerned with the physical, social, intellectual, emotional, moral, and spiritual development of the children. Classes are available in the morning and run from 8:30 a.m. until noon. Our director is Mrs. Mia Lynch and can be contacted at 256-7304 or click here to send an email. AWANA is a popular program designed to reach children and youth for Christ and train them to serve Him. AWANA runs each Wednesday night of the school year from 6:05 until 7:30 p.m. AWANA clubs include the Puggles, for ages 2 and a half to 3, Cubbies for ages 3 and 4, Sparks for grades K - 2, Truth and Training for grades 3 - 6, Trek for grades 7 - 8, and Journey for High School students. We invite anyone from the Dayton community to join our AWANA program. There is a Bible Study for adults that also takes place during AWANA. To securely register for our 2013-2014 AWANA club click on the button below, fill out the information and click submit. Each year in July we hold our VBS inviting children from our Church and the community to share in a week long themed adventure that includes music, dancing, food, games, crafts, learning scripture verses, and learning more about Christ. Classes for all ages run from 9:15-10:15 on Sunday morning. Various curriculum are used at different levels. Children have fun and learn of Christ and the Bible from caring and loving teachers. 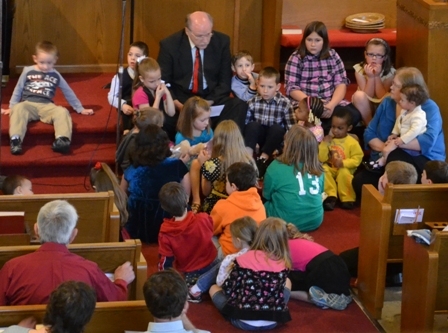 Children take part in the beginning part of the morning worship service, where there is a special children's sermon for them. Then children ages 3 through 5th grade are dismissed to go downstairs where they are divided up into separate age groups. The children experience worship and instruction geared to their age levels and parents are given the luxury of worshiping while their children are being taught and cared for. A fully equipped nursery is provided, with separate sections for infants and toddlers. Parents can feel secure leaving their little ones in a safe and comfortable environment. From May through August we will kick-off our summer Children's Ministry Program commonly known as CKK. This summer program replaces our Awana Club program that runs during the school year. We will be diving back into the new and exciting lesson series called Answers for Kids. This lesson series will include lots of fun lessons, projects, and activities for our kids' ages 3yrs. to those who will be completing 6th grade. Come out, bring your friends and join us for a great upcoming summer here with our kids' summer programs!